After a false start that was synchronized with the ill-fated launch of Microsoft’s Vista operating system, hybrid HDDs have been a technology that is rarely ever mentioned. So far the hybrid HDD has been the sole domain of Seagate Technology with its Momentus XT. Seagate introduced this drive in May 2010 and by August 2011 announced the shipment of over one million units. This is a positive sign for a product that is groundbreaking and has no alternate sources. Either one of these could cause users and OEMs to steer clear waiting for others to take the risk. The Momentus XT has been very well received by reviewers for its high speed and large capacity at an affordable price. Objective Analysis is bullish on the concept of small amounts of NAND flash in the PC. 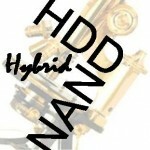 The report: Have Hybrid Drives Finally Come of Age? explains this viewpoint and can be purchased for immediate download from our website.